Southwest Airlines has announced a tentative ggreement has been reached with the Aircraft Mechanics Fraternal Association (AMFA), which represents the Company’s 2,400 employees in the Aircraft Mechanics and Related workgroup. The agreement gives employees improved compensation, a ratification bonus, and updated work rules. AMFA will communicate directly to its membership about the ratification process. If the agreement is approved, the contract will become amendable April 1, 2023. Copyright Photo: Southwest Airlines Boeing 737-8H4 SSWL N8693A (msn 36921) LAX (Michael B. Ing). Image: 942439. 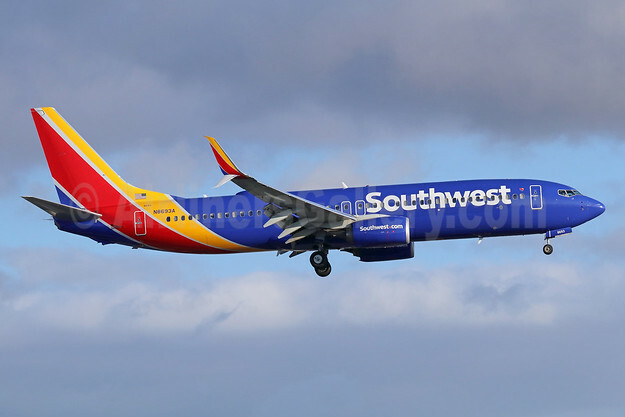 This entry was posted in Southwest Airlines and tagged Boeing 737-8H4 SSWL, msn 36921, N8693A, Southwest Airlines on June 28, 2018 by Bruce Drum.